Delhi: A city-based private hospital and three of its doctors have been ordered to pay Rs 64 lakh to a woman by the apex consumer forum for their negligence in giving requisite treatment to her premature baby resulting in the infant becoming blind for life. Maharaja Agrasen Hospital in Delhi and three of its doctors have been ordered by the National Consumer Disputes Redressal Commission (NCDRC) to pay the amount as compensation to the mother of the child for the medical practitioners’ negligence in screening the infant’s eyes, which is the practice in the case of premature babies. According to the complaint of the child’s mother, Pooja Sharma, the baby was in the hospital for nearly five weeks, but during this period the doctors did not carry out the screening and as a result no one noticed that the infant’s retina was displaced. It was much later when she noticed the baby’s abnormal visual response that a eye-check up was done which showed total retinal detachment. 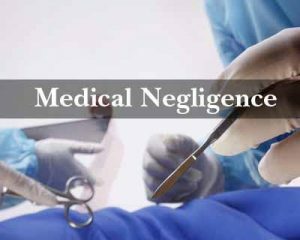 The hospital and its doctors had denied the allegation of negligence and had contended that the screening was carried out and it had not revealed any problems. They also said that the mother was advised to come again for follow up checks. After perusal of the medical records, the court said, “We are not convinced whether the Retinopathy of prematurity (ROP) screening was done”. ROP screening is carried out of premature babies to see if there is any abnormal blood vessel development in the retina of the eye. “The progress sheet is devoid of details about ROP examination viz. who performed it, the method, instruments used and drugs (midrates/ tropicamide)/anaesthesia used during ROP testing. The doctor has not mentioned any details of dilation of pupil and findings of indirect ophthalmoscope findings, the intra ocular or extra retinal findings. “Thus, it was a casual approach of opposite parties towards the premature baby. The opposite party 5 (senior consultant opthalmologist) has not followed standard ROP screening protocol. Thus ‘no record means, it was not done’. Even the nurses’ daily record does not show any ROP examination was done,” the forum said in its order. “The patient visited hospital for follow up, but nothing is in record about ROP testing. It is not a standard of practice or due care of the patient. Thus, a medical negligence,” it added. The apex consumer forum has directed the private hospital and three doctors to pay Rs 64 lakh as compensation, including the cost of litigation, to the child and his mother.